Steaming is the Healthiest Way to Cook Vegetables, Hands Down! 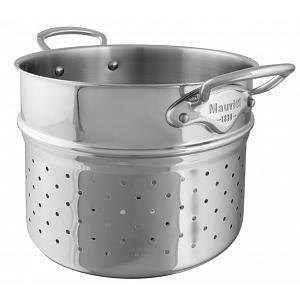 The Mauviel's M'cook stainless steel steamer insert provides the healthiest option to cooking vegetables. When you boil your veggies, many of the nutrients will get lost (the longer you boilt them, the more will be lost!). Steaming allows you to quickly cook your vegetables without sacrificing nutrients and taste. The steamer is easy to use too! Simply add the steamer into a 24cm pot of boiling water, place a lid on it, and let it steam. 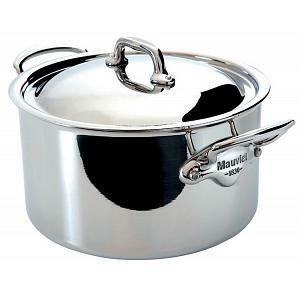 The Mauviel stainless steel steamer insert offers you the highest culinary technology. 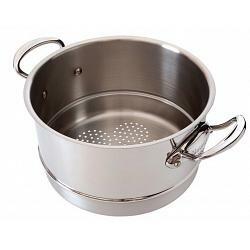 The steamer features a 5 layer multi-ply 18/10 stainless steel construction. 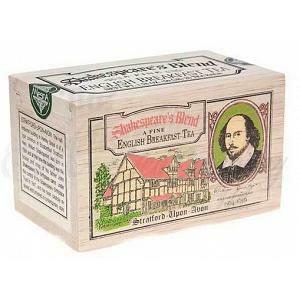 It features a polished outside finish that is sure to look amazing in your kitchen. The steamer has stainless steel handles, securely attached with rivets. The steamer measures 24cm / 9.5 inches and fits pots with the same diameter. It's dishwasher safe and has a lifetime warranty. The steamer was made in France by Mauviel.